Your sim has arrived at their destination and now they're ready for an adventure! But what will they do when they stumble into an ancient Tomb? Explore the area or try the adventure board for locations on where your sim can go for a bit of an adventure! Ok, you can't just waltz right into a dungeon, take the treasure and then leave! There's going to be problems to get through and secrets you must figure out, so be careful. Some Dive Wells contain tunnels inside them that can lead to another room inside the tomb or building. These rooms may contain items that your Sim needs during their adventure, such as a keystone. When you find a tunnel, your Sim will be notified and ask whether to go back to the surface or to explore tunnel. Dive wells are also useful for getting the "soaked" moodlet prior to attempting to cross Fire or Electric traps. Floor switches come in two types: one your Sim steps on, and one your Sim drags a statue onto. They generally unlock doors and other things needed to progress. Pangu's Axe must be found in one of the Temple of Heaven tomb adventures in China in order to remove/destroy giant boulders. Hovering your mouse over the walls of a tomb will often reveal the location of hidden doors. To uncover the door, use the 'Inspect' interaction. The door will either open automatically, or your sim will need to Open it themselves. Sims may need a high level of Athletic skill to open certain doors. 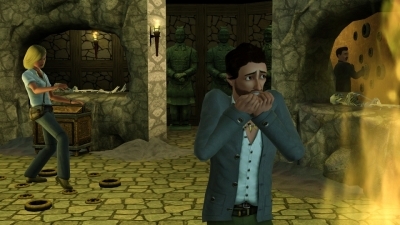 A sim stuck in a dungeon. Entrances can be unlocked with keystones. 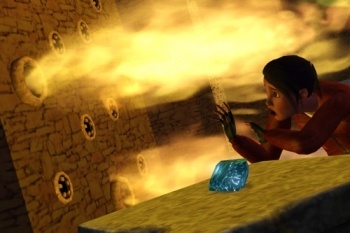 A keystone come from two main sources : (1) It is given to the Sim by an NPC at the start of a new adventure (2) It is found in treasure chests in locations near the locked door. Keystones come in a myriad of shapes including and not limited to Heart, Crescent, and Key. A "Skeleton Key" Adventure Reward can be purchased from the Special Merchant in any of the three locations, which will unlock any door. A keystone remains in your Sim's inventory (backpack) even if he or she returns home without activating the keystone, and can be used when he or she wishes to continue the adventure on the next vacation. Mummies are quite slow but very skilled in Martial Arts. 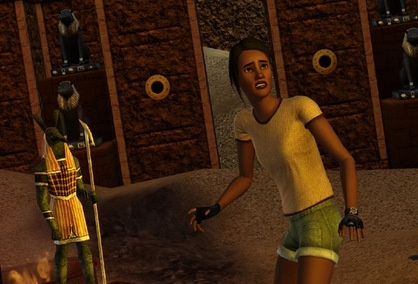 If a sim disturbs a mummy while exploring tombs, the mummy will rise from its sarcophagus and fight the sim who disturbed it. If a sim loses the match then they then become cursed. For more information, see Mummies. To identify a pushable statue, hover your mouse over the statue. If the cursor comes with an asterisk (*), this means the statue is selectable. This statue can be moved. Some statues may need to be Inspected before you will be allowed to move them. There are 2 main actions associated with a statue - push and pull. Of the selection menu, four options are available : push, push far, pull, and pull far. When selecting the far options, your Sim will push or pull the statue until they hit a wall or until you manually cancel the action. They will not stop automatically even if they trigger floor switches. When your cursor hovers on a side of a pushable statue, you will see a little arrow that denotes the direction you can push or pull that side in. There is no diagonal movement for statues; you can only move forwards or backwards, left or right. No, your sims arm won't come off, neither will they be hurt. Tomb holes can contain ancient coins, relics or other small objects. They may also contain switches that open secret doors or disable traps. To explore a Tomb Hole, click on it and choose "Inspect." Beware though - these can also scare your sims, with bugs that may come crawling out of the hole, your sim will yank their hand out and wait for the bugs to disappear before putting their arm back into the hole. Most sims will get a Fear Moodlet when doing this and will need to wait till it wears off before Inspecting any other holes, but Brave trait sims will just shrug it off. Some Sims, trying to avoid traps . Traps don't kill your Sims. However, they can injure your Sim. When a trap is activated it will have a particular effect on your Sim, depending on what trap you activate. Your Sim will receive a negative moodlet and will have to wait a given period of time before they want to do something. World Adventures comes with several different types of traps, each with their own unique effects. A sim trying to avoid a fire trap. Fire traps shoot jets of flame which can burn your sims. Sims that get caught by fire traps will get a Singed Moodlet and will look burned until they shower. Don't get caught by a fire trap again with that moodlet or your sim can burn to death! Mummy sims can die the first time they get burned by a fire trap, so be careful. Using a Dive Well to get Soaked will prevent the fire trap from burning your sim, but going around a tomb all soggy isn't that much fun. Dart traps shoot darts at your sims. Sims that get caught by a dart trap will fall asleep. Steam traps shoot billowing white jets of steam which can startle your sims, but don't appear to be damaging. Steam traps leave puddles all over the floor, and if they're positioned just right, can disarm Fire Traps. Electric traps have blue arcs of electricity that can zap your sims. Using the "Disarm" interaction on the trap. Whether or not the trap will be able to be disarmed depends on your sim's Mechanical skill, and the trap's difficulty level. Push a Pushable Statue over the top of the trap. It will break the trap and it will not reactivate if you move the statue off of it afterward. Find the activator that controls the trap. This can be a floor switch, tomb hole, or any number of other items. Pass over an inactive fire or electric trap while Soaked to leave a puddle to disarm the trap. It's not all danger in tombs - there's also great treasures to be discovered! A man mining in a rubble pile. Ancient coins are hidden around tombs and dungeons. You can use ancient coins to buy items from the "special merchants", provided you have the required Visa Level. While adventuring, your sim may come across a rubble pile. Underneath the rubble pile you may find treasure: simoleons, ancient coins, gems and ingots, or relics. You might also find a keystone or Tomb Hole needed to proceed further in the tomb. Sims with higher Athletic skill levels find clearing rubble easier than other Sims and they don't use as much energy; rubble clearing raises the Athletic skill. 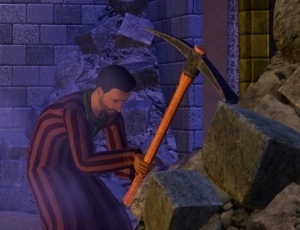 Pangu's Axe allows your sim to clear a rubble pile with a single blow. A treasure chest can objects or ancient coins. To open a treasure chest, click on it and select 'Open'. A mini pop up screen will show up once you have opened the chest. Clicking the 'Take All' button will transfer all contents of the treasure chest to the active sim's inventory. You can also place items in treasure chests - just Open the treasure chest first and then drag the object from your sim's inventory into the chest. This can be useful on certain Adventures as well as if you purchase a chest from the General Merchant to store your valuables at home. This page has been accessed 92,189 times.